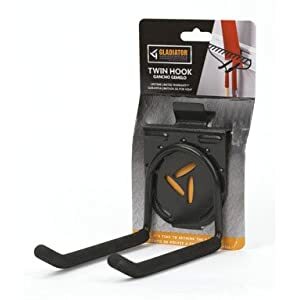 These Twin Hooks work great for storing lawn and garden tools and equipment. This hook measures 2.75-Inch wide x 4.25-Inch high x 6.5-Inch deep and works great for hanging up your long handled garden tools such as shovels and rakes. As with all wall accessories, the twin hook is constructed of welded steel and is rated to hold up to 25-Pounds per hook. It’s been lab tested 100-Pounds per hook, so you know they are under-rated. The hooks are also padded to protect your items from scratches. I use my hooks for catching life jackets, bike helmets, roller blades, and my kids Razor scooters in addition to hanging brooms,and garden tools. The Twin Hook accessory easily mounts in seconds to the Gladiator Gear Track or Wall System securely latching in place. The beauty is the hooks can be quickly repositioned as your storage needs change without the use of any tools.